San Clemente Island is approximately 21 nm long and is 4-1/2 nm across at its widest point. It is owned by the US Navy and used for various military exercises. Fishing and diving are permitted around the island, however civilians may not touch the island in any way. For more information, including hazardous operations schedules for specific areas, visit San Clemente Island Info. Often times large sections or all of the island are closed due to military exercises. If you are caught in these areas they will chase you out with a gun boat. Please see the SCI Hazardous Operations Area Schedule before heading out. There are a variety of game fish which can be found here year round including : Calico Bass, White Sea Bass, Halibut, Rockfish, and homeguard Yellowtail. Seasonally, migrating Yellowtail and Barracuda may also be taken from the Island. Also, Albacore, Bluefin Tuna, Yellowfin tuna, Dorado and Marlin are taken some years just a few miles off shore. Spring and Summer are the best times to fish here although some good bites on the White Sea Bass and homeguard Yellowtail are known to happen during the spring months when the squid start to show. West Cove : 33.00.26 / 118.33.22 - No anchoring allowed due to underwater military equipment. Wilson's Cove : 32.58.55 / 118.32.19 - No anchoring allowed due to underwater military equipment. Pyramid Reef : 32.48.00 / 118.21.30 - Very shallow, be careful. I WORK OUT HERE ON SAN CLEMENTE ISLAND IN THE SECURITY DEPT. ONE THING THAT I HAVE NOTICED ABOUT FISHERMAN AND DIVERS WHO COME OUT TO THE ISLAND IS THAT THEY ARE UNSURE OF THE RESTRICTED AREAS. IF YOU COULD ADD SOME INFORMATION TO YOUR WEB SITE I'M SURE IT WOULD MAKE FOR A MORE ENJOYABLE TRIP FOR EVERYONE WHO WISHES TO COME OUT. FIRST, TO HAVE A LIST OF ALL OF THE RESTRICTED AREAS AND THE RULES, MARINERS SHOULD PURCHASE OR STUDY A NOAA CHART (CHART 18762). ALSO NOTE THAT WHILE IT IS OK TO TRANSIT WEST COVE, IT IS FORBIDDEN TO ANCHOR, DROP LOBSTER POTS, AND DROP BOUYS IN THIS AREA DUE TO SENSITIVE EQUIPMENT UNDER THE WATER. A NOTE TO DIVERS WOULD BE TO ENSURE THAT THEY HAVE SOMEONE ONBOARD AT ALL TIMES TO MONITOR MARINE BAND CHANNEL 16. DIVERS SHOULD ALSO ENSURE TO REGULATION DIVE FLAG. HOPEFULLY THIS WILL HELP TO CLAIRIFY SOME OF THE CONFUSION. GOOD LUCK TO EVERY ONE!!!!! Was stationed on the Island back in the mid-50s with the Air Force. At that time, we had 100 or so personnel at the radar station there and the tour there was considered overseas duty by the Air Force. There was a handful of Navy men stationed at the airstrip in the middle of the Island and one Marine who maintained an El Toro airfield radio. The Air Force living quarters were a few hundred feet from the end of the pier and the radar and radio works were on the east-west road about halfway between Wilson Cove and the airfield. Years earlier someone had planted three trees on the road a short distance from the barracks and there was a sign there that said "You are now entering San Clemente national forest". Pass the three tress and another sign declared "You are now leaving San Clemente national forest". There was another sign at the end of the pier that stated "Welcome to San Clemente Island. Recommended by Duncan Hines". At that time there were three ways to get to the mainland from the Island; catch a naval plane at the airstrip and go to San Diego, take a yard freighter from the Wilson Cove pier into Long Beach, or chance an Avalon Airways seaplane flight to Long Beach. On one occasion an Avalon pilot tried to land at the pier with the wheels down and the plane went right to the bottom. I arrived on the Island in about May of 1957 and was reassigned in around September on 1958. The typical tour there was for 18 months and we worked three weeks on and one week off. The off time was spent most often, at least by me and a few of my friends, in Los Angeles. Several of the men did a lot of diving and often brought back abalone and lobsters, most of which were never shared with the rest of us. One of my roommates kept a live goat tied to the end of his bed for a short time and he once kept a human skeleton in a box under his bed; apparently he found the bones on the Island. I do remember that beer was ten cents a can in the airman's club and liquor was twenty-five cents a drink. At the time there was a one or two lane bowling alley and a pool room, movies nightly, diving and water skiing equipment (including boat) that we could use, and a TV room that was open 24 hours. However, most of us spent the largest share of our free time playing poker and drinking at the airman's club. If you know something about this island or have some photos that you'd like to share, please E-mail and I'll post it here! 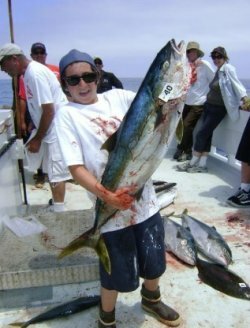 14 year old Jojo Shapiro with his first yellowtail - a 40 pounder! Caught on an overnight trip to SCI on 8/13/2009.